During @TerrierHockey‘s undefeated week (2-0-1), sophomore d-man @KKotkansalototaled 18 blocked shots with at least five in each game. ►The Daily Free Press previewsnext Saturday’s home game against #6/7 Quinnipiac. 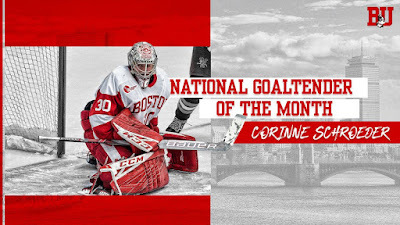 Sophomore goaltender Corinne Schroeder was named December’s National Goaltender of the Month by Women’s Hockey Commissioners Association. In four starts, she went 3-0-1 with a 1.02 GAA and .964 save percentage.